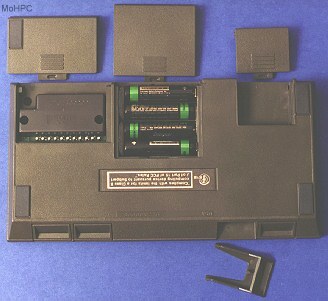 The HP-71 was a small handheld computer/calculator featuring both QWERTY and calculator/numeric keypads. It was the first handheld to implement the (then proposed) IEEE floating point math standard which included such concepts as infinities and non-numbers. In the display. The user would then press End Line to display the final answer of 55. The calculator also allowed backing out of any expression, for example after the user pressed the second ) in 5*(4+5), the calculator would display 5*(9), but after pressing BACK, the cursor would move back into the parentheses and the display would show 5*(4+5). The user could undo as much of an expression as desired. Finally, though it was algebraic, it had an input stack. The cursor up/down keys could be used to retrieve previous stacked expressions. 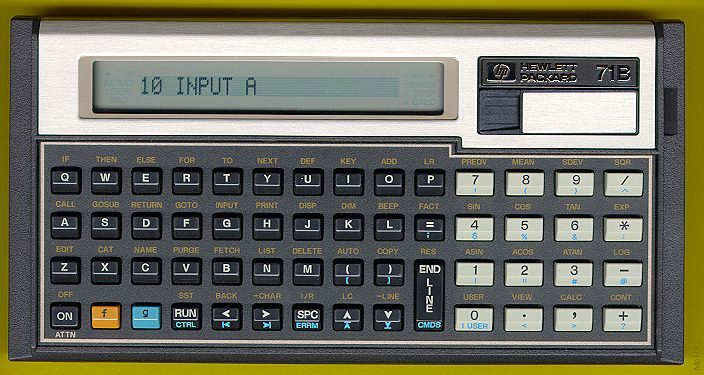 Unlike most versions of BASIC, the HP-71B allowed (in BASIC or calc mode) automatic/dynamic dimensioning. Thus a user could assign d(5)=10 without first dimensioning D. String variables were automatically dimensioned as well. Like the HP-85 the HP-71B provided a real time clock and timers with BASIC language support allowing it to be used as a small portable device controller. The language included subroutine calls to BASIC or assembly language with parameter passing and recursion. The single line 22 character LCD display was scrollable within a 5 line by 96 character command stack. The display could also be used in an 8 by 132 pixel graphics mode. 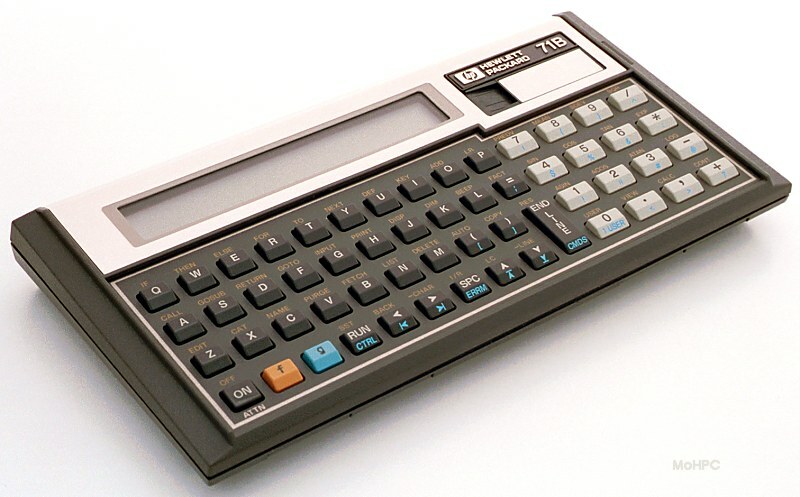 In addition to the QWERTY style keyboard of the HP-75C/D the HP-71B provided a numeric/calculator keypad and provided typing aids for many keywords. (For example to enter "IF THEN ELSE", the user could press and hold the "f" shift key and press Q W E.) Every key on the keyboard (except the shift keys themselves) could be redefined by the user. The HP-71B had a full set of file management commands such as COPY, CATalog, and RENAME. Plug in RAM modules could either be merged with system memory (the default) or kept as separate spaces with their own private file systems. The file system also allowed secure and private files. Secure files were protected from accidental deletion or modification. Private files could not be modified or copied. The file security extended not only to normal file system commands but even to the BASIC keywords PEEK and POKE which, except for security, could view or alter any part of memory. The HP-71B could have a password assigned to the entire machine with the LOCK statement. Once set, the HP-71B asked for the password each time it was turned on and and turned itself back off if the incorrect password was supplied. The only way to defeat the password was to remove the batteries, thus ensuring the privacy of the data. The HP-71B was the first calculator/computer to use the Saturn CPU. This chip and its derivatives are used in all modern HP calculators. The HP-71B came with 64K bytes of ROM containing the BASIC language and operating system and 17.5K of user RAM. The address space of the processor was 512K bytes (1M nibbles). Expansion was by four ports in the front/bottom of the unit. At introduction, 4K RAM modules and ROM modules up to 64K were available. The ROM modules typically added keywords to the built-in BASIC's already impressive set of 240. The HP-71B was designed as an open machine. HP made available detailed documentation which described OS information (including full source code), file formats, how to create BASIC extensions, etc. In the pictures below, the card reader/writer has been installed and is immediately below the logo in the upper right. Cards go in the dark depression just below the [(hp)] logo and exit through the slot visible on the right side. In the Rear view the upper left open compartment shows card reader/writer installed. Middle open compartment shows batteries. Upper right compartment is where the HP-IL module could be installed. One of the four lower ROM/RAM compartments has also been opened.